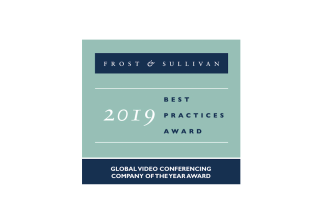 Zoom has been named the 2019 Company of the Year in the Global Video Conferencing Industry by analyst firm Frost & Sullivan. The selection of this award is derived from primary market analysis and in-depth interviews conducted by the Frost & Sullivan industry analyst team. The Company of the Year Award selection process is based on excellence in growth, innovation, and leadership. Specifically, superior performance in three key areas—demand generation, brand development, and competitive positioning—play a crucial role when selecting the Company of the Year. To read Frost & Sullivan’s in-depth analysis of Zoom and the video conferencing market, download the full report here.